First things first, how new is voice search? In our beginner’s guide, we’ll help you navigate this newest optimization landscape, with details of what it means for your brand and tips for getting started. Voice search optimization seems to have exploded this year, with several industry insiders marking it as one to watch. However, this form of search has actually been around for a while, with Google picking up on the trend as far back as 2014, when it says it realized voice search had more than doubled in popularity in just 12 months. Google’s initial data showed that voice search was more popular with a younger demographic, with teens in particular embracing the technology. The search engine reported that adults were less keen on talking to their phones in the presence of others. Fast forward three years and the landscape is different. Forbes has declared 2017 to be the year of voice search, a trend fuelled by digital assistants such as Alexa, Siri and Cortana. 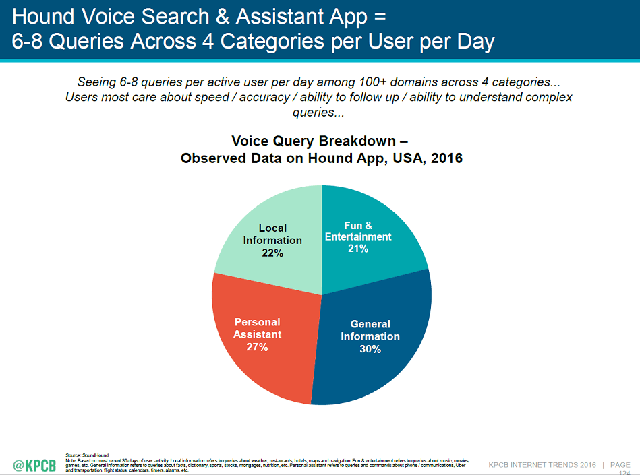 The Mary Meeker State of the Internet 2017 report shows that voice search accounts for 20% of mobile search queries. The 2016 report calculated a 35-fold voice search increase since 2008, with a 7-fold increase between 2010–16. Why do people turn to voice search and what are they looking for? With voice search growing in popularity, and the number of voice-enabled devices also growing, it’s well worth considering a voice search category for your brand. For many businesses, the local information and general information searches will be of the most interest. Local search is an area of particular relevance, given that many users turn to voice when driving and requiring a hands free method of information. It’s natural to turn to voice search in the car in order to find a local or ‘near me’ search result, such as a gas station, supermarket, garage or store. The key thing to remember before you embark on a voice search optimization campaign is that voice search is often more nuanced than text-based queries. The syntax, phrasing and language choice is much more natural and less truncated than a traditional Google search may be, where consumers are used to search shorthand and Google’s predictive capabilities generating relevant results. For example, for a voice search you might say “where is the nearest gas station to my location?” whereas a traditional search query might look like “nearest gas station”. 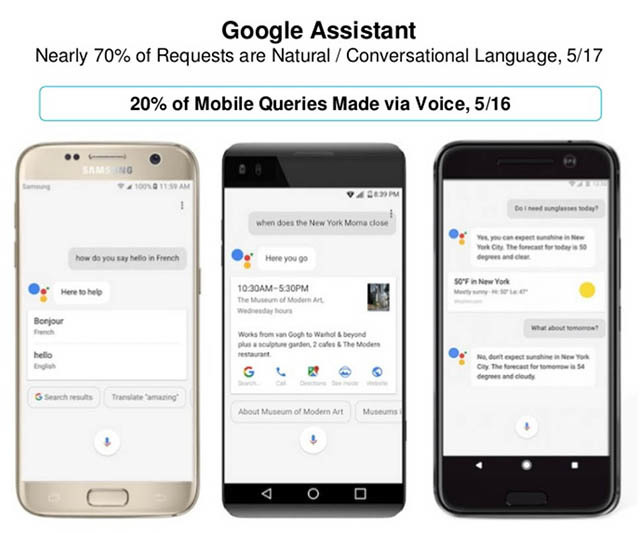 Voice search terms are often more intent-based, with users turning to voice when they have an immediate need for a product or service. Domino’s AnyWare is a great example of this action-based trend in use. It can be used from a range of devices including Google Home, voice, Amazon Echo, Facebook Messenger and smart watches to order a pie. So instead of clicking, cruising the menu, selecting your pizza and checking out, you can simply say “I want a large deep dish Hawaiian” or “I want my easy order” and your pizza will be baked and delivered directly to you. This type of action or intent-rich search makes lives much easier for consumers and speeds up the process of ordering goods and services as well as completing tasks such as booking appointments. Now that you know what voice search is, when it’s used, why it’s used and what it’s used for, you can begin to optimize for search. The natural place to start is with your local listings, as this is when voice search really comes into its own. Google My Business: As voice search works well for ‘near me’ style searches, start off by logging into your Google My Business interface. Make sure all of your address info is complete, with zip code and full street addresses. This is the first step to showing local relevance when a voice search is conducted. Check your citations: If you are a local business, such as a Domino’s pizza store or local pet shop, you’ll more than likely be listed in at least one or two local directories and in places besides Google My Business. You’ll need to check all of these citations and where you have a partial citation, such as an address without zip code or no category information, update it to a full citation. A full citation will have your name, full address and phone number. Review landing page language: As we have seen above, voice search tends to be much more closely relation to natural speech than traditional text based searches. That means you’ll also need to build some content around those relevant, natural search queries. Starting with longer tail keywords can provide a foundation but you’ll need to go beyond this to create content that reflects natural speech. In much the same way as you’d include short and long tail keywords in landing pages for traditional search, you need to work the more natural speech patterns into your voice optimized content. And don’t forget mobile: Most of your voice search traffic will come from a mobile device. This means mobile optimization is also a crucial part of voice optimization. Focus on the basics of usability such as page loading times, employing AMP, compressing images, using smaller amounts of text, custom menus and thumb-friendly buttons. Have you used voice search as a consumer? Have you started to optimize your site for voice search from an SEO perspective? Share your experiences with us in the comments below.